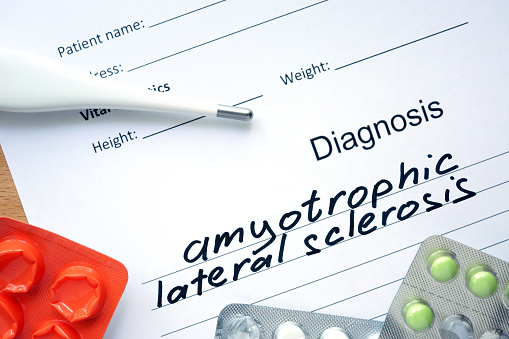 For some time, scientists have known that a specific gene was the most common cause of amyotrophic lateral sclerosis (ALS) and frontotemporal dementia (FTD), but the exact reason remained elusive. Now, a team from the University of Toronto’s Faculty of Medicine has determined how the gene functions in both its normal state and when causing disease. By creating special antibodies that can “tag” the proteins that the gene—named C9orf72—produces, the scientists were able to understand its purpose in the body. It appears from their findings that the proteins would surround the nucleus of motor neuron cells. In this position, the proteins appear to help transport other essential proteins in and out of the nucleus, the cell’s control center. It was also found that in cases of ALS or FTD, the proteins collect on the outside of the cell’s membrane rather than inside around the nucleus. Protein pathways are a very precise chain of events with each being passed off to the next stage in the process. Without the C9orf72 proteins around a motor neuron’s nucleus, the cell is unable to properly receive or send out other important proteins. The result is that the cell dies. As more neurons fail and die, the symptoms of ALS and FTD increase in severity. The good news is that the particular protein pathway C9orf72 is involved with is known to be affected by already-existing drugs. With the obstacle of finding a way to target the pathway already solved, the main task is to devise applicable treatments. Once a way of restoring or mimicking C9orf72’s part of the protein pathway is established, it can be worked into an improved treatment. ALS is a neuromuscular disease that progresses from mild weakness to complete paralysis; approximately 5,600 people in the U.S. are diagnosed with it annually. FTD is a form of dementia that is sometimes mistaken for Alzheimer’s; it can cause memory loss and deprive people of movement or speech. Babcock, K., “Mixed Up Cell Transportation Key Piece of ALS and Dementia Puzzle,” University of Toronto, Faculty of Medicine web site, October 5, 2015; http://medicine.utoronto.ca/news/mixed-cell-transportation-key-piece-als-and-dementia-puzzle. “Facts You Should Know,” ALS Association web site; http://www.alsa.org/about-als/facts-you-should-know.html, last accessed October 6, 2015. Xiao, S., et al., “Isoform-specific Antibodies Reveal Distinct Subcellular Localizations of C9orf72 in Amyotrophic Lateral Sclerosis,” Annals of Neurology 2015; 78(4): 568–83, doi:10.1002/ana.24469.